Daily Illuminator: Get On The Right Track! July 1, 2013: Get On The Right Track! 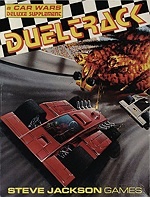 Drive yourself crazy with the latest Car Wars classic to appear on e23: Dueltrack! With this supplement you'll get info on gas-powered engines, high-speed racing, metal armor, and more. You can even bring your game forward by looking to the past, with "Chassis & Crossbow" -- low-tech autoduelling where riding "shotgun" was really important. This digital set provides rules, counters, and road sections (including printer-friendly pre-cropped versions); coupled with Car Wars Classic or the Car Wars Compendium, you'll be burning rubber just as soon as you fire up your printer!